So that year, we began what has now grown into an incredible journey as the venue has changed (many times) over the years, but it all began in the multi-purpose room of St. Timothy’s Episcopal Church in Danville, CA. That first year we delivered about 45 bikes to those in need. From those humble beginnings we have continued to grow. We spent two more years at St. Timothy’s as the program continued to grow in numbers (i.e. bikes delivered) and, most importantly, in the number of volunteers (experienced mechanics, cleaners, etc.) needed to do the work. But, three years into the program, the flooding of St. Tim’s basement drove the program to find another “home”, which required a dedicated, well-lit (and heated) location for about two months, from early November until Christmas. Enter: Local Real Estate Champions! Mr. Gary Riele responded to our plea for a temporary home and we spent our fourth year in a small (1300 sq.ft.) commercial space in the Town and Country Center in downtown Danville. Since then we have continued to grow. In 2008, working out of a 4,000 sq. ft. space, we had our biggest year to date as a local Boy Scout Troop conducted a bike drive and we finished the season with a record setting 267 Bikes. 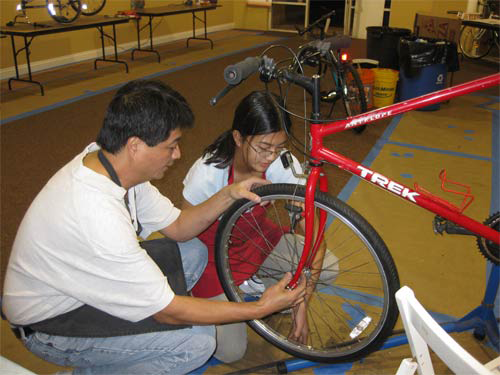 Since 2002, the AAFB Program has supplied over 3,600 bikes, for kids and adults alike, all in excellent mechanical working condition, and THAT is what makes all the difference. The AAFB team works on a very simple principle: “No bike can bring joy if the wheels don’t spin!” And we apply that principle to every aspect of the bikes we handle. They are delivered clean, safe, and in good mechanical working order. The Bike Drive is reaching far and wide, as is the need for bike mechanics to fill the work schedule for the season. 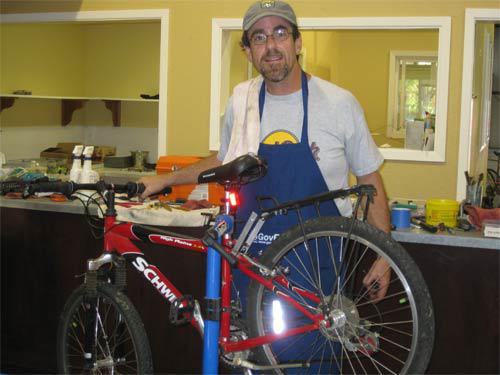 We need volunteers of all skill levels, but experienced individuals with bike repair knowledge are ALWAYS in need. All bike sizes are needed – ranging from lil’-tike bikes for young children learning how to ride, to all types of kid, teenager and adult bikes for those who need transportation to get to school or work. The Monument Crisis Center, historically a primary beneficiary of the AAF program, provides food, education, assistance and referrals to low-income families and individuals in crisis situations. We’ve also included Options Recovery, an alcohol & drug rehabilitation program which primarily needs men/women’s bikes, again to get to school, work or appointments. Many bikes are delivered to the West Contra Costa Unified School District (sister schools to the San Ramon Valley Unified School District) and distributed to different grade levels of needy children. As the bike donations have grown we’ve also included distribution to the Salvation Army which needs bikes in all sizes, shapes and styles. The bikes are a daily necessity for the majority of the recipients because many cannot afford cars or bus fare to get to school, work, or appointments. The joy in a child’s eyes and the gratitude from an adult recipient are immense. The bikes make a big difference and there’s always a need. So join the AAFB team, in any way you can. We welcome your bike donations, your help, and any monetary donations to help pay for the parts we must buy to bring these gifts into good working and safe condition. Thank You and Happy Holidays!!!! !